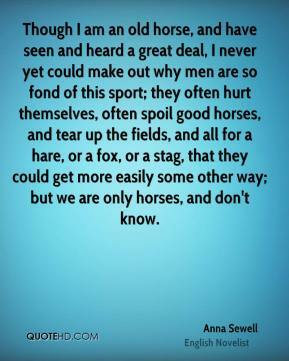 Though I am an old horse, and have seen and heard a great deal, I never yet could make out why men are so fond of this sport; they often hurt themselves, often spoil good horses, and tear up the fields, and all for a hare, or a fox, or a stag, that they could get more easily some other way; but we are only horses, and don't know. 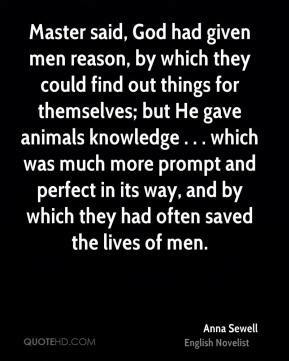 Master said, God had given men reason, by which they could find out things for themselves; but He gave animals knowledge . . . which was much more prompt and perfect in its way, and by which they had often saved the lives of men.